Irene Smith: There are many descendants of my Great, Great Grandparents, Joseph and Sarah Mills (nee Small) who lived in Coventry, England. Joseph (senior) had a hand weaving Mill in Well Street, Coventry. This is all that has been obtained of the early history of the Mills family, as all records were destroyed during the bombing raids over Coventry, of the War in 1939-45. Both Great, Great-Grandparents are buried in the Coventry Cemetery. One of the younger descendants in Australia, Lyle Ford, visited Coventry Cemetery recently, and found their graves, and attended to them. As far as is known of their family, they had a son, Joseph, born at Cromton, England, in the year 1816. Later he-attended the Bablake school at Coventry. Joseph left school at the age of twelve. After school years, Joseph worked at his father’s weaving Mill. When he completed his apprenticeship, he was admitted to the freedom of the City, Coventry, in June 1835. At the age of nineteen years he married Sarah Hill, who was eighteen years of age, born in the year 1819. They were married in the Holy Trinity Church of England, Coventry, England, on the 24th. March I834. As power machines were developed, and brought into existence for many business firms, the hand weaving mills gradually closed down. Joseph and Sarah had eight children, two of the older children died from cold and sickness in England. So they decided to move to a warmer climate. The deaths of the two children, and the mill closing down, was the cause of the family deciding to migrate to Australia, hoping for a better life for all the family. So the decision was made and they planned to go to Queensland, Australia. In the year 1865, on March 10th, they left England on the Boat “LOBILIA”, from Plymouth, arriving in Morton Bay, Queensland, 2nd.July 1865. While anchored at Morton Bay, Sarah Mills became ill, and passed away on 6th July 1865. So, early on the 7th, July, Sarah’s body was taken ashore by some of the crew, and by order of the Ship’s Captain, was buried on Mud Island in Moreton Bay, Queensland, at the age of 46 years. Top Queensland medics have given up hope of ever solving the Mud Island body-in-the-box riddle. 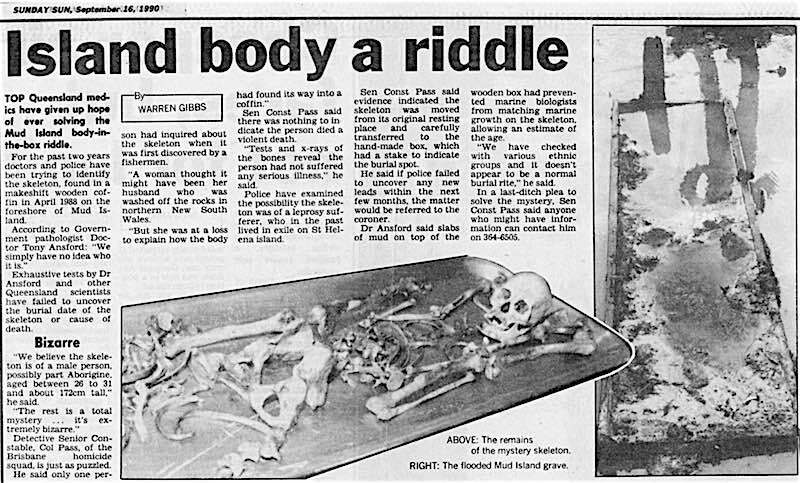 For the past two years doctors and police have been trying to identify the skeleton, found in a makeshift wooden coffin in April 1988 on the foreshore of Mud Island. Exhaustive tests by Dr Ansford and other Queensland scientists have failed to uncover the burial date of the skeleton or the cause of death. “We believe the skeleton is of a male person, possibly part Aborigine, aged between 26 and 31 and about 172 cm tall,” he said. Detective Senior Constable Col Pass of the Brisbane Homicide squad is just as puzzled. He said only one person had inquired about the skeleton when it was first discovered by a fisherman. Sen. Const Pass said there was nothing to indicate the person died a violent death. “Tests and x-rays of the bones reveal the person had not suffered any serious illness” he said. Police have examined the possibility the skeleton was a leprosy sufferer, who in the past lived in exile on St.Helena Island. Sen. Const Pass said evidence indicated the skeleton was moved from its original resting place and carefully transferred to the hand-made box which had a stake to indicate the burial spot. He said if police failed to uncover any new leads within the next few months, the matter would be referred to the coroner. Dr Ansford said slabs of mud on top of the wooden box had prevented marine biologists from matching marine growth on the skeleton, allowing an estimate of the age. “We have checked with various ethnic groups and it doesn’t appear to be a normal burial rite,” he said. In a last ditch plea to solve the mystery, Sen. Const Pass said anyone who might have information can contact him on 364-6505. The Cameron Family has a long history in Australia, beginning with the arrival of Samson Cameron in Tasmania in the early 1800s. One of their children, John, moved to Brisbane in March 1861. In October 1864 John Cameron began the firm of Cameron Brothers, which would become a Brisbane icon. He introduced the concept into Queensland of subdividing large blocks of land into smaller allotments. 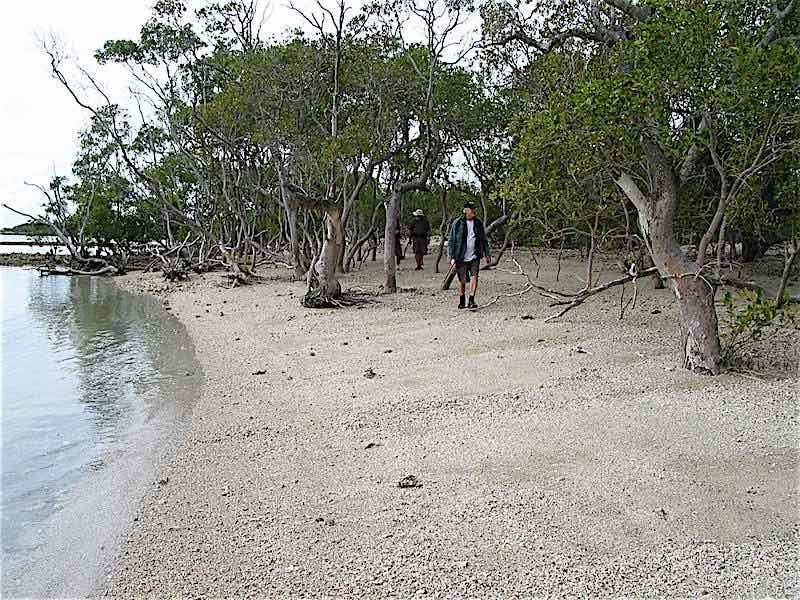 Their first land subdivision in the Redlands was at Redland Bay. John’s association with Brisbane butcher, Patrick Mayne, began early in his career and the firm negotiated many property deals for the Mayne family. 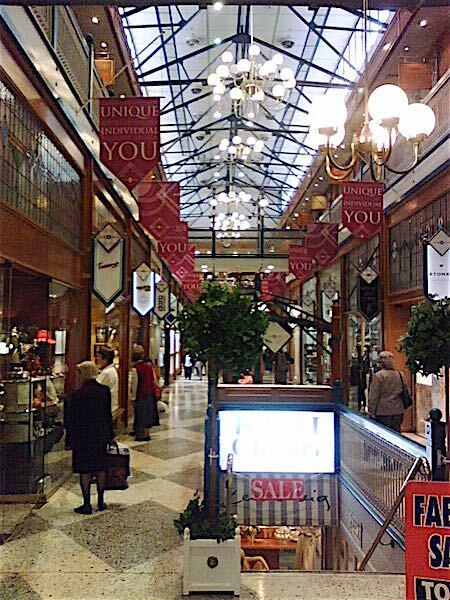 The Brisbane Arcade is still owned by the Mayne Estate and was managed by the Cameron Brothers for 60 years. The Cameron family has also been involved in the Redlands for many generations. 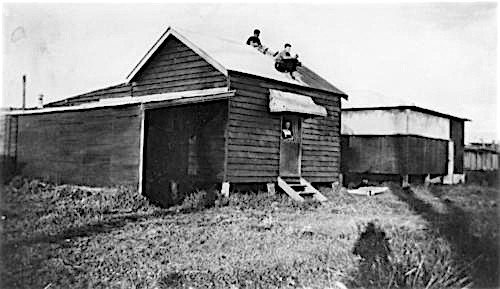 In 1884 John Cameron built the iconic ‘Doobawah’ on a ten acre block of land at Ormiston on the corner of Wellington and Eckersley Streets, with water frontage to Moreton Bay and Raby Bay. (Doobawah is the Aboriginal name for Raby Bay). 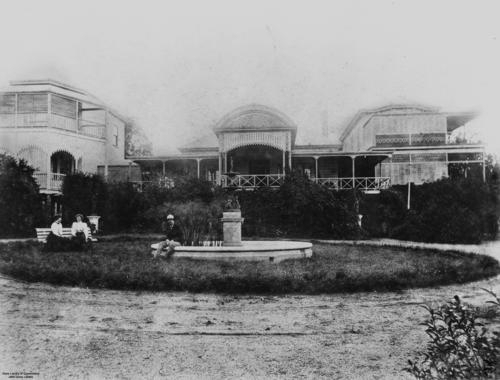 The house had two wings, and in 1902, the family sold these two wings: one becoming the Holyrood Hospital on Gregory Terrace (later the Country Women’s Hostel) and the other part of St John’s College in Kangaroo Point. 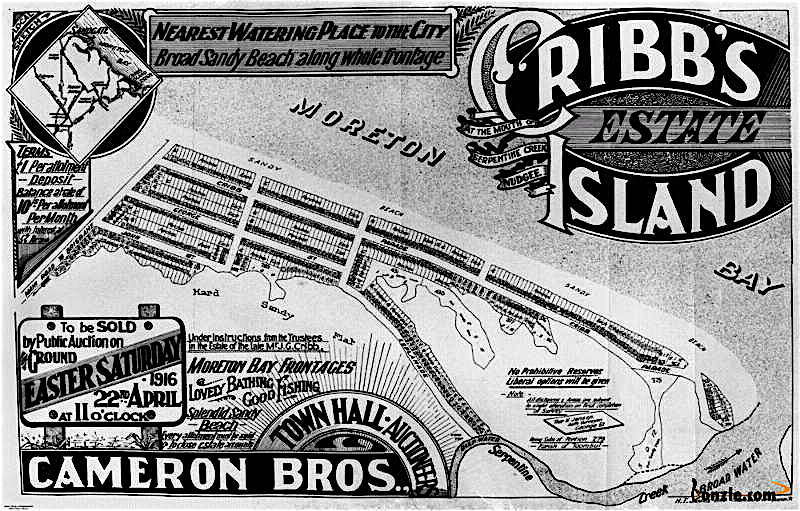 “Cribb Island was originally named after John George Cribb, a Brisbane Banker and later businessman (of Cribb and Foote fame) who in 1863 purchased 150 acres of low lying land bordering Moreton Bay just north of Serpentine Creek at the mouth of the Brisbane River. In 1886 Cribb sold 65 acres to James Jackson who went on to grow pineapples, bananas and watermelons there. He even had his own pineapple cannery. Because the makeshift road to Cribb Island was submerged at high tide, James Jackson built a flat-bottomed punt “Bramble” to transport his produce to the Brisbane markets. Fish, caught by both weekend fishermen and professionals, were also sent to market on the “Bramble”. “Other men also farmed and ran dairy and poultry on the Cribb estate until 1913 when the remaining 80 acres were sold for subdivision into building blocks. This area was then known as Cribb Town. “Early in the 1920s, my brother, Alex had begun a bus service at East Brisbane, and in 1925 moved with his family to Cribb Island and commenced a bus service to Brisbane. Cribb Island was a popular fishing spot and safe swimming beach. 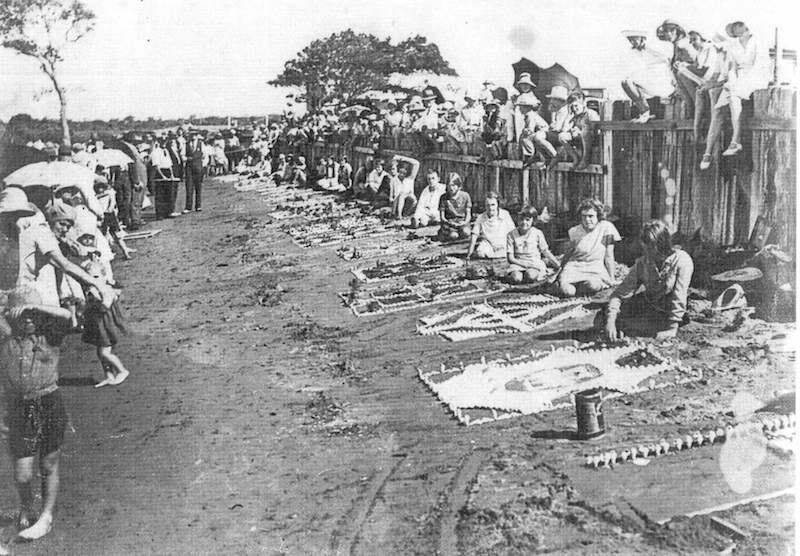 Sculpturing competitions in the area’s black sand were a popular event. Weekend entertainment in the form of vaudeville concerts was often held on an open stage erected on Jackson’s estate. “Eventually the Gibson’s had to move into a bigger house at Cribb Island, which also included a garage for the buses and sleeping accommodation for the drivers, myself, Ernie Gibson and Jack Campbell, who all took our meals with the family. Known as the “Red and White Line” the service began with 2 buses and eventually expanded to 14. It ran to Nudgee railway station as well as Brisbane. 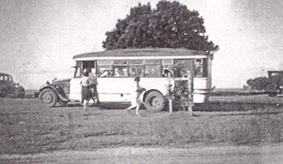 “During WWII, the Cribb Island buses could be commandeered at any time by the American Army forces, which were then billeted at Eagle Farm Racecourse. If objections were raised, the army just threatened to send out drivers and take over themselves. Alex had no option but to comply, and borrowed buses from J.T.Ford of Sandgate and Hornibrook Highway to try to get his disgruntled passengers to and from their homes.